Ava Gardner, 1922 - 1990, film star, lived and died here. 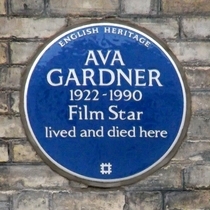 Gardner lived in the first floor apartment, 1968 until her death here in 1990. The Irish Examiner has some photos of the rather garish interior (or did at one time, the link is sometimes dead). See the Wandsworth chapel for the truth of the 1573 claim.